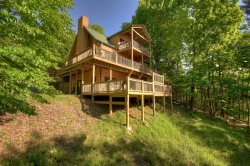 Find yourself on the front deck of this gorgeous mountain home...listening to the crickets chirp and watching the moon rise up out of the mountains. Serenity is in the palm of your hands at this well appointed 3 bedroom, 3 bathroom abode. Walking into the front door of Moonrise Kingdom, you'll be greeted with soaring cathedral ceilings and a stunning view of the mountains shining through the prow-front windows. Convenience and privacy abound as each level offers it's own bedroom and bathroom. Of course, the entry level offers a fully equipped kitchen so that no matter how far you are from home, your tummy doesn't have to know. Enjoy your feast at the comfortable dining room table gracing you with a view of the mountains. Or take morning coffee and breakfast outside and just take in what nature has to offer. No need to neglect keeping up with your favorite shows; just watch them on the flat panel TV in the living room. If you're here to simply unwind and get away from it all, there's a pool table and a hot tub downstairs, calling your name. The lower level den has everything for ultimate comfort for lounging around after a tough day of hiking, shopping or adventuring. If you are looking for something a little more peaceful and quiet, put yourself in the upstairs loft/reading nook. Lay around on the cozy futon as you dive deep into that novel you've been waiting to start! Come to Moonrise Kingdom to experience the ultimate vacation you've been needing. Located in Mineral Bluff just 15 minutes from downtown Blue Ridge shopping and dining. they were very helpful and knowledgeable about the property. it was the most relaxing and enjoyable vacation we have had. we needed the quiet and peacefulness of this vacation to recharge and just take a min for ourselves before we head back to the real world and our jobs!! They all go above and beyond. Very friendly, personable, professional. Thank you for giving us a beautiful vacation. It has totally spoiled us. We know we can trust you. The check I was excellent.....not sure of her name, but she is pregnant due on June 22.... she was very knowledgeable about job. She made us feel welcome. Because of her interaction with my family, I will definitely recommend Southern Comfort to my friends and family. Our family spring break 2018 was the best because of our stay at Southern Comfort Cabins. It was a great experience and will definitely be doing it again. Kim was very helpful and friendly on the phone with answering my questions and it was so easy to arrange everything - the emails were straight forward and the whole process was very smooth. Stephanie did a wonderful job in preparing the cabin for our visit - it was perfect! It was an absolutely wonderful visit! We loved the cabin and were so appreciative of everything - the cabin is beautifully decorated and the furniture is very comfortable. The beds where comfortable and had really nice linens - we slept great! There were plenty of dishes and cookware and appliances that I was not even expecting. Everything inside was clean and set up to be very welcoming when we arrived, and that was really nice. Very nice and peaceful,cabin was great!